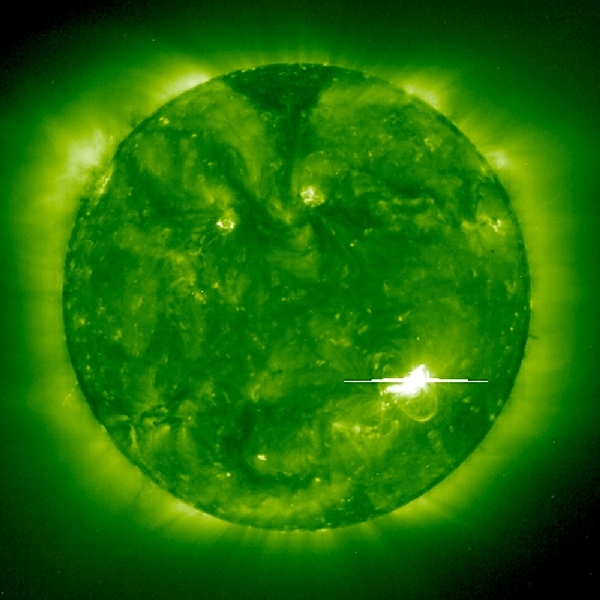 A bright solar flare is captured by the EIT 195Å instrument on 1998 May 2. A solar flare (a sudden, rapid, and intense variation in brightness) occurs when magnetic energy that has built up in the solar atmosphere is suddenly released, launching material outward at millions of km per hour. The Suns magnetic fields tend to restrain each other and force the buildup of tremendous energy, like twisting rubber bands, so much that they eventually break. At some point, the magnetic lines of force merge and cancel in a process known as magnetic reconnection, causing plasma to forcefully escape from the Sun.